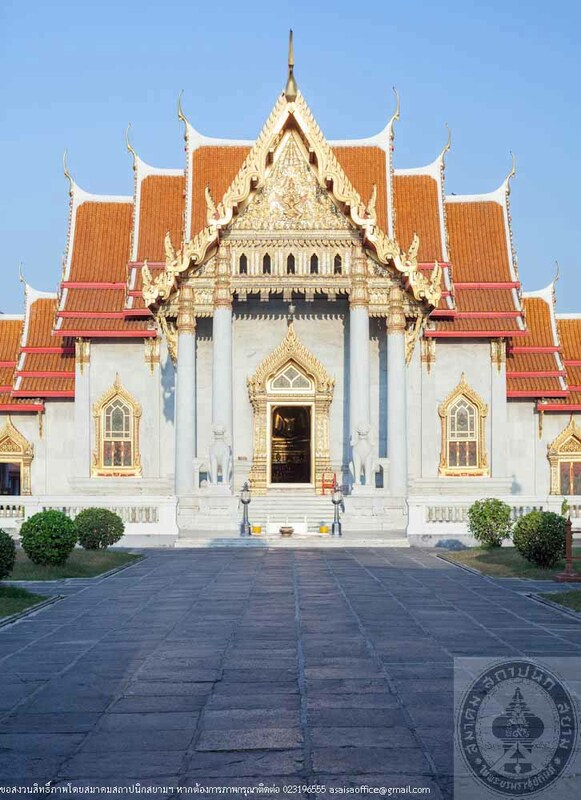 Wat Benchamabophit Dusitvanaram is a first class Royal temple of the grade Rajavoravihara. 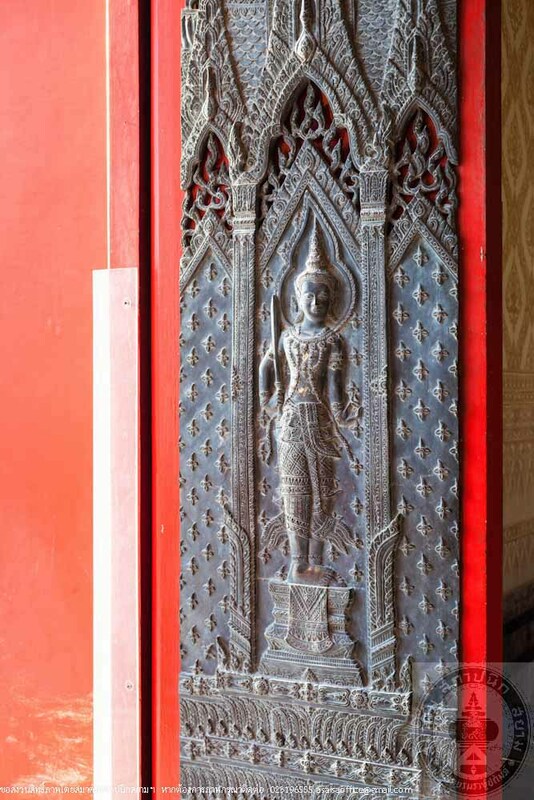 Formally an ancient temple known by the name of “Wat Laem” or “Wat Sai Thong,” there is no historical evidence attesting to its origin. 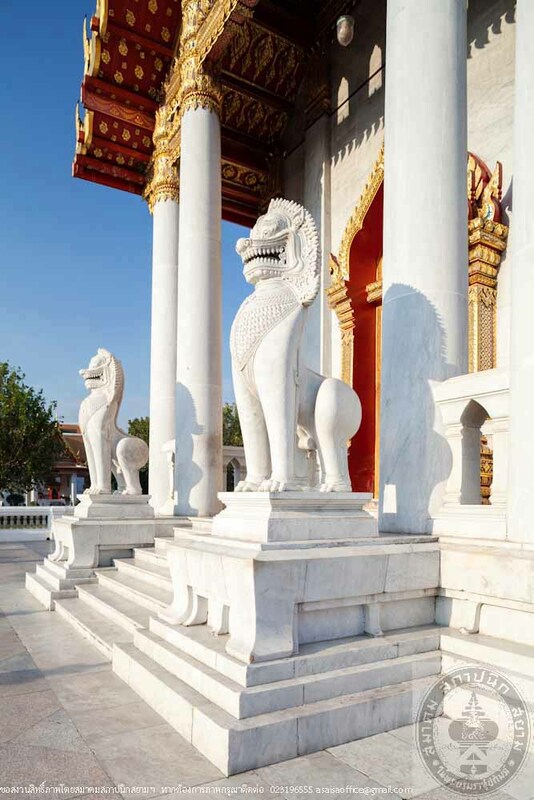 Until 1826, during the reign of King Nangklao, Rama III, the temple’s presence emerged in the history of Thailand when Prince Anuvongs (King of Vientiane, a vassal state of Siam) led a Laotian rebellion against Siam. King Nangklao sent Prince Bibidh Bhogabhubendra (Prince Panomwan who was born to King Phra Buddha Lertla Napalai and Chao Chom Sila, founder of the Panomwan family) as commander of the army to protect the capital. 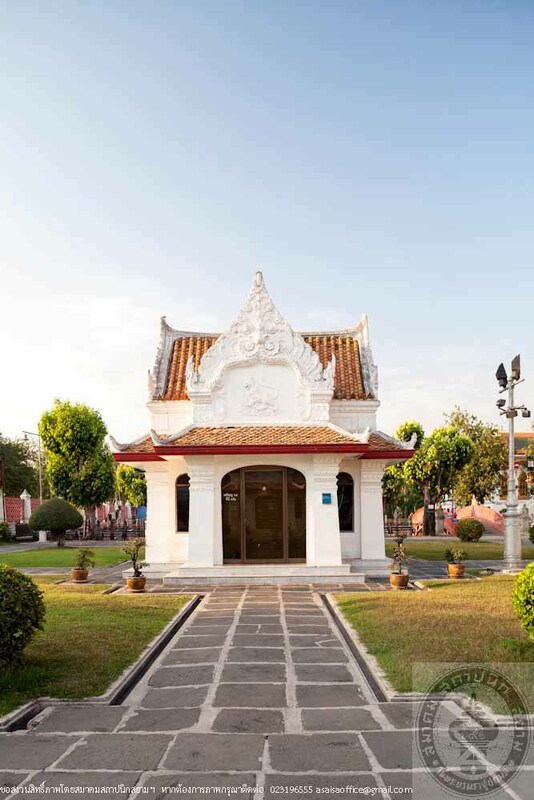 The compound of “Wat Laem” or “Wat Sai Thong” served as his command post. After putting down the rebellion, Prince Bibidh Bhogabhubendra, along with his 4 siblings of the maternal parent, jointly restored the temple from 1827 to 1828. Five pagodas were built along the front of the temple in commemoration of the five siblings. 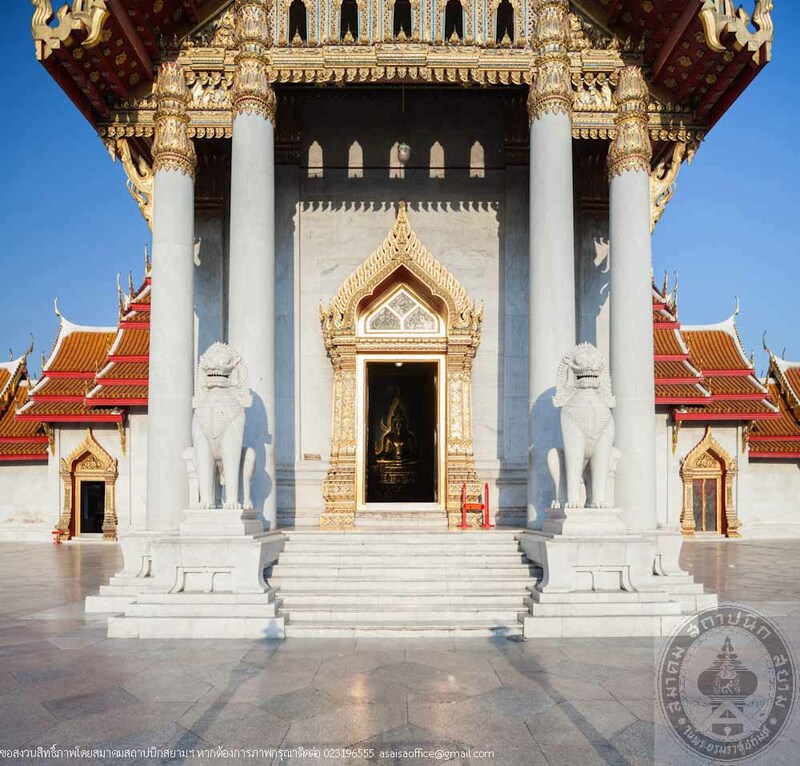 According to the Royal Almanac, King Mongkut renamed the temple “Wat Benchamabophit” which means the temple of the five royalties or the temple restored by the five. Thereafter, Wat Benchamabophit fell into disrepair. King Chulalongkorn, Rama V, conducted “Patikam” (an act of generosity to increase the profit of the temple) and restored the temple. 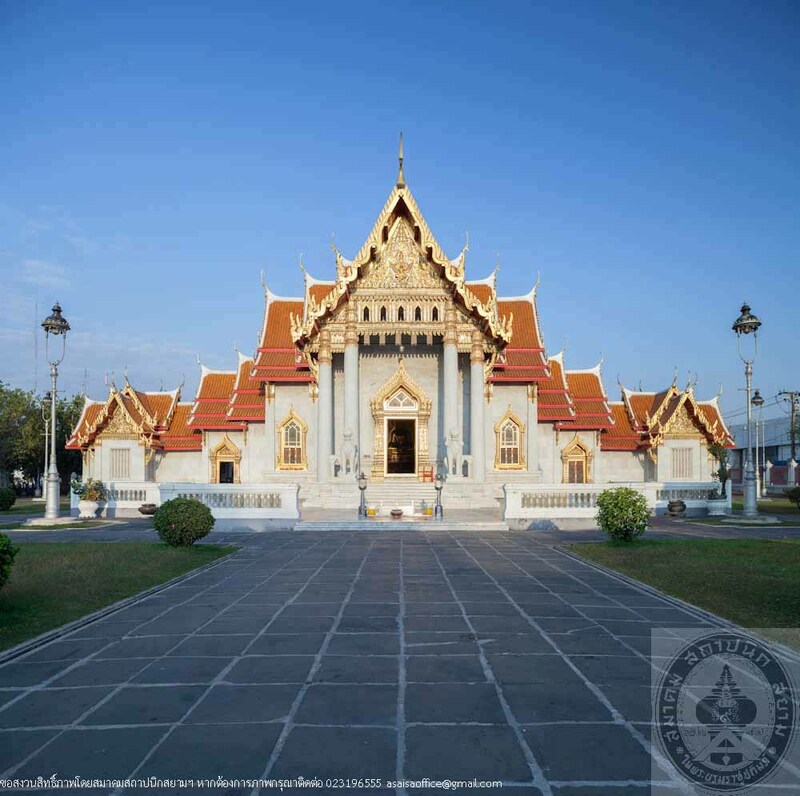 He declared the establishment of the temple on March 1, 1899 as well as renaming it “Wat Benchamabophit Dusitvanaram” in which most of the religious structures are of ancient Thai architecture. The temple’s layout plan was created to divide the temple compound into sections; i.e. Buddhavas section and Sangkhavas section, separated from each other by a man-made canal; and the monastery property for the monks’ attendants’ living quarter. Important structures within the Buddhavas section include the main chapel, cloister (gallery), pavilion in front of the chapel and Tri-Muk pavilion at the bridges. The main chapel is a tetrahedron with marble wall. An extended verandah in the east. The small verandah in the north and south connecting to the four-tiered roof cloister. The north and south verandah’s roof are five-tiered. A gallery surrounding the main chapel in rear. Cho Fah, Bai Raka, Hang Hong lacquered and gilded with solid gold. 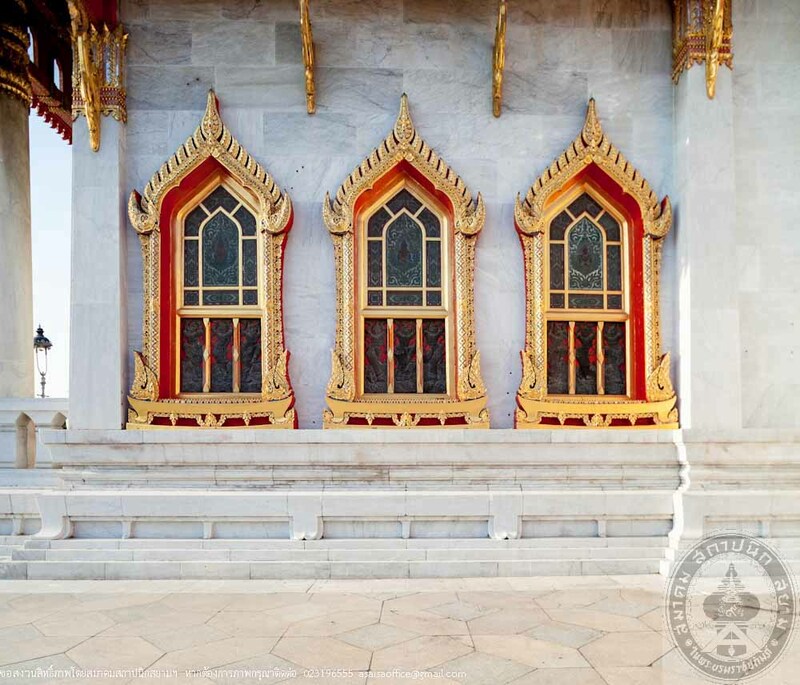 The pediment engraved with Thai style pattern and a variety of seals also lacquered and gilded with gold and embellished with glass. Yellow coated arch tiles. Antefix with figure of the deva. 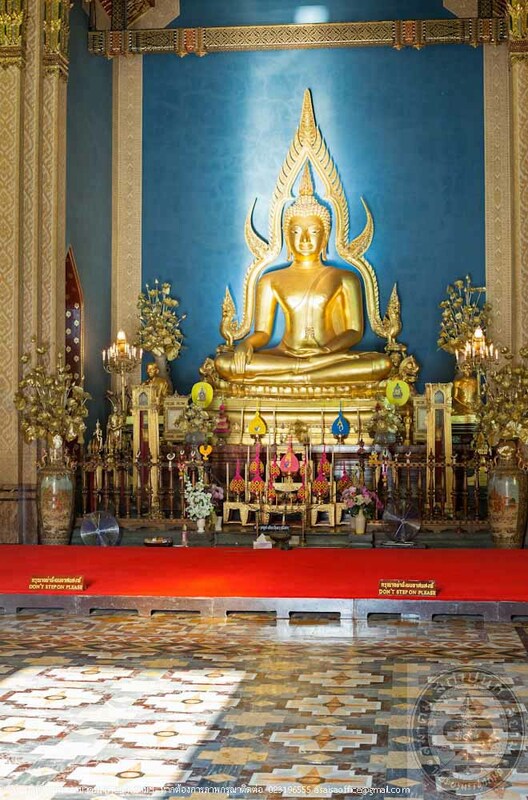 The west wing of the chapel situated Phra Buddhajinaraja, a duplicate of Phra Buddhajinaraja in Phitsanulok. The Cloister (gallery) that connects to the verandah to the north and south encircle the main chapel leaving a large courtyard between the chapel and the cloister. The floor of the courtyard is a carpet of light pink and grey granite. The door on the west side in direct aligns with the chapel west porch. There are two doors each on the south and north side of the chapel. Embossed metal sheet attached to the outside door while the inside is gold appliqué on black lacquer. The cloister flooring is light yellow and white marble. 64 Solid marble round pillars and 28 square pillars with marble covers. Lotus shaped capitals decorated with glass. Concrete wall inside and white marble tiles on the outside. Solid windows with marble bars around the cloister making 48 gaps between the bars. Cho Fah, Bai Raka, Hang Hongs Lamyong are all lacquered and gilded with solid gold. 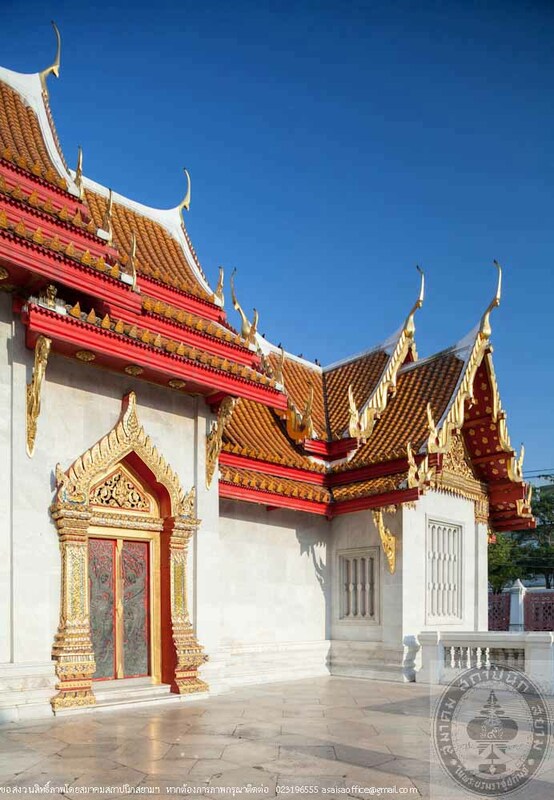 The pediment features Thai painting and petroglyph arts with emblems of the 10 Ministries according to the new state administration plan developed in the reign of King Rama V. Exposed beams covered with lacquer and gilded with gold appliqué. The ceilings are overlaid with cinnabar lacquer decorated with 610 star ornaments and situated 52 Buddha images. Two pavilions in front of the main chapel including “Mom Chuey” pavilion in the south and “Yai-Rabiab” in the north. The two brick masonry tetrahedron pavilions featuring an open space and marble flooring with double layered roofs covered with colored tiles. Painting and Khmer inscription on the pediments. 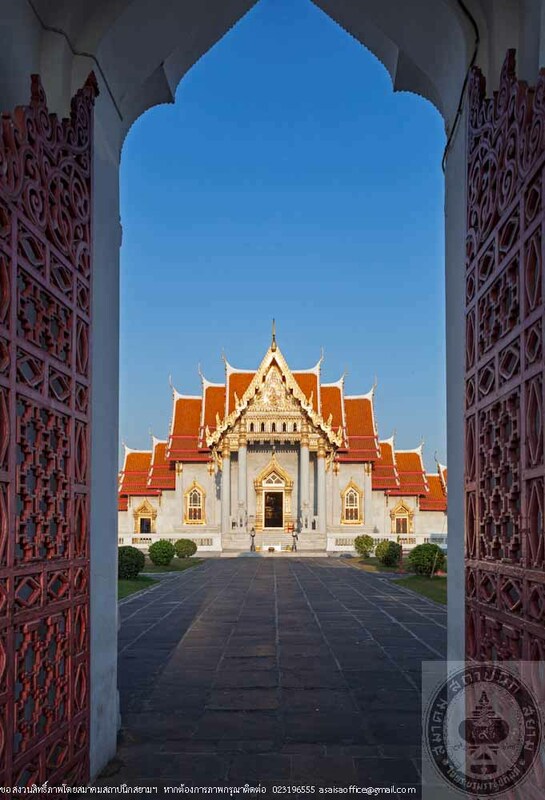 The Bridge Pavilion located in the east, on the north side of the canal was built by “Queen Sukhumala Marasri in commemoration of Chao Khun Chom Manda Samli (a concubine of King Mongkut, Rama IV.) The tetrahedron pavilion is covered with colored roof tiles and concrete floor with two sets of stairs going down into the water. 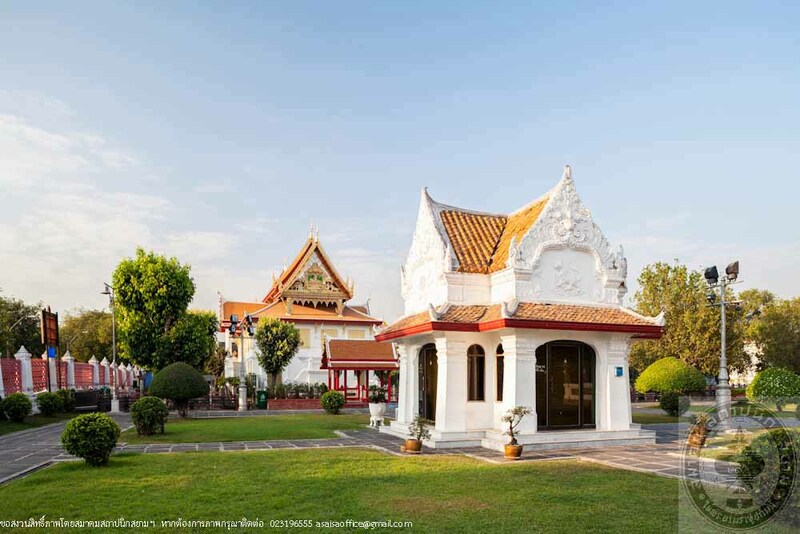 The Main Chapel, cloister (gallery), the front pavilions, the bridge pavilion and Bhuddhavas area of Wat Benchamabophit Dusitvanaram have been well-maintained and are in good condition. All of the valuable architectural elements are well-preserved and are very complete.